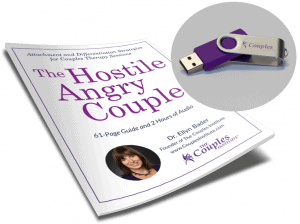 This set includes a USB drive with 2 one-hour seminars discussing The Hostile Angry Couple and a printed 62-page book. This comprehensive collection of material will help you take a stronger leadership role and be more targeted in your interventions with angry partners. With the tools and skills presented here, you might even discover that you enjoy working with these couples who can otherwise be so intimidating. Develop Yourself as a More Effective Therapist. The USB drive has 2 one-hour audios. The printed book contains 1) written transcripts of the seminars for study or review, 2) Powerpoint slides from the original live seminars, and 3) client handouts for use with your hostile angry couples. $59.00 through April 15 only, order now, regularly $79!